When Gail asked for a new flavor idea for Father’s Day, I, of course, had to draw upon my own father for inspiration. When I think of root beer, I think of summers, 4th of July barbecues, and my dad. The man loves root beer. There’s even a brand of root beer called “Dad’s Root Beer”, although, that’s not his favorite brand. His favorite is A&W. I know this because my dad has systematically tried any and all brands of root beer he has ever come across. I think there’s something so American about root beer that genuinely appeals to him. 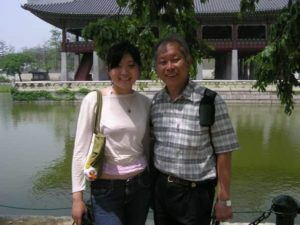 My dad came to the US shortly after my sister and I were born to try and make a better life for his family. The American Dream of freedom, autonomy, and home ownership was something he wanted to be a part of his legacy. For the first few years after we immigrated to the United States, my dad embraced all things “American”. He even insisted all family dinner conversations be held in English. That was until he became frustrated at our language ineptitude and switched back to Chinese. Try as he might though, he’s only managed to spread his love of root beer to one of his daughters, me. One summer during my youth, my dad excitedly announces to my sister and I that he was going to embark on a home improvement project. He had a crazy look in his eye, “I’m going to turn the staircase around.” A feng shui expert had told my dad he was unlucky and the reason why was the staircase in his house. The bottom of the staircase lined up perfectly with the front door and therefore all the luck and good fortune had a direct path out of the house. At that point my dad had just suffered a house fire and a burglary back to back. He was probably in a vulnerable place but it was all my dad needed to hear: a tangible, completely fixable cause to his problems. The next day he was at Home Depot buying 2×4’s and nails to turn his staircase and his life around. Every day during that summer I spent sitting at the top of the stairs watching my dad work, sharing a Big Gulp of root beer, chatting with him and asking him weird little kid questions. He had an answer for everything. Sometimes after our lunch break, we’d continue our weird chats about hypothetical things over a root beer float on the picnic table in his backyard overlooking the fruit trees and San Gabriel Mountains. It was the best conversations I’ve ever had with my father. My dad still loves root beer, and root beer floats, although he can’t have it as much now that he’s older and his health is fading. I don’t get to see my dad as often nowadays, and our conversations are more formal and fewer and farther in between, but I always appreciate the times I do get to Skype with him. 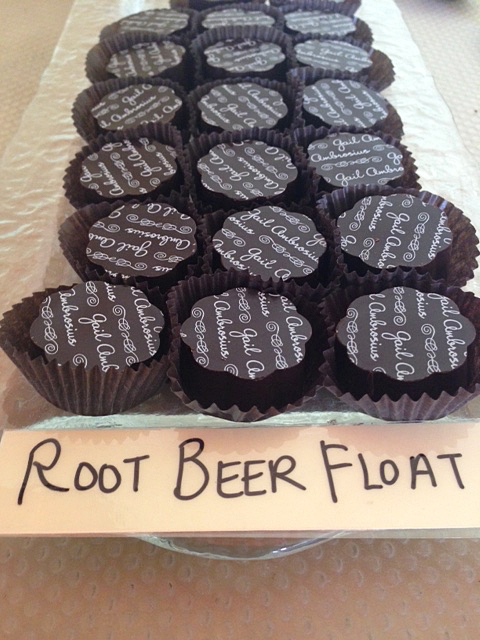 This Root Beer Float truffle is a tribute to my dad, the fun and playful dad of my childhood memories.